Polished lava from Mount Vesuvius, c 1770. Hand-coloured etching by Peter Fabris (active 1768-1779). Illustrated plate from William Hamilton's study of Italian volcanoes, 'Campi Phlegraei' (published in Naples, 1776). 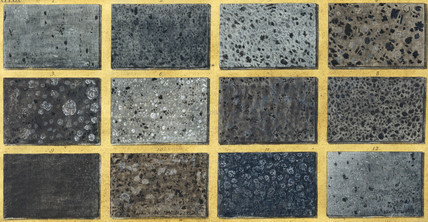 Specimens of polished lava taken from Vesuvius by Hamilton to illustrate the types lava found in this region, including (1) the type used to pave the streets of Naples. Based on letters sent to the Royal Society, Hamilton's book is a seminal work on the nature and effects of volcanic activity. Volcanic activity on Mount Vesuvius, Kingdom of Naples, 1779. An eruption of Mount Vesuvius as seen from Posillipo, Kingdom of Naples, 9 August 1779. Volcanic material from Mount Vesuvius, 1779. Volcanic rocks from Mount Vesuvius, 1779. Volcanos in the Lipari Islands, Sicily, c 1776. Mount Vesuvius' crater, Kingdom of Naples, 1767. Naples as seen from Posillipo, Kingdom of Naples, c 1766.